Pointwise Version 17.2 is now available for download and production use. The main new feature in this latest release of the software is an extension of the T-Rex hybrid meshing technique to create layers of near-wall hexahedra. Through an extension of the algorithm that post-processes the tetrahedra generated by the T-Rex advancing layer technique (anisotropic tetrahedral extrusion), the high aspect ratio tetrahedra created by extrusion from a quad surface grid can now be agglomerated into hexahedra. At its core, T-Rex is an advancing layer technique that starts from a triangle surface mesh and extrudes layers of high aspect ratio, right angle included tetrahedra near walls, wakes, and other features. Those tetrahedra are post-processed (optionally) by combining three successive tetrahedra into a prism. The ability to post-process the stacks of extruded tetrahedra into hexrahedra begins with a quadrilateral surface mesh off of which the first extruded cell is a pyramid. The regular T-Rex extrusion takes over from there. The cells are then post-processed into stacks of hexahedra. See Figure 1 for an example. This extension also adds to T-Rex the ability to have an existing quadrilateral mesh serve as a boundary condition for a T-Rex prism extrusion. Figure 1: A layer of hexahedra in the boundary layer (green) was generated using the latest version of T-Rex. The Draw Curves button on the toolbar has been modified to be a dropdown menu allowing you to either select the default curve type and begin drawing or choose another curve type which then becomes the default. A half-symmetry grid can now automatically be mirrored on export to create a full grid. Blocks with internal faces, both closed and open, can now be assembled automatically. The quality of shaded surface display has been improved through the use of OpenGL shaders (on supported hardware). Also, a user-positionable light source has been added as shown in Figure 2. Entities selected in the Examine, Rules command remain selected when the command is closed. This way you can use the Rules to identify bad grids, select them, and have them remain selected for the Solver or other commands. Figure 2: The new user-positionable light source can be fixed in space rather than always at the viewer's location. In addition to Red Hat Linux, Pointwise is now supported on SUSE Linux, CentOS, and Ubuntu. Pointwise now exports pyramids to Nastran files as true pyramids and not degenerate prisms. Pointwise now supports the latest version of the CFD file standard, CGNS v3.2. With this upgrade Pointwise is now able to export both unstructured and structured zones to the same CGNS file. Pointwise is now compatible with NASA's FUN3D flow solver. Pointwise can now export to the GAMBIT neutral file format. GAMBIT neutral files are ASCII based and store mesh and boundary condition information. 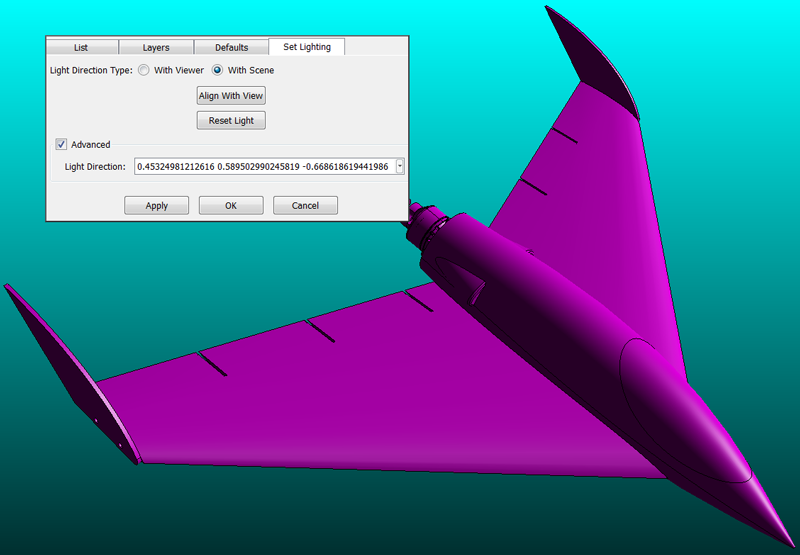 The Pointwise STAR-CD v4 CAE exporter plugin now uses the SDK face streaming API. 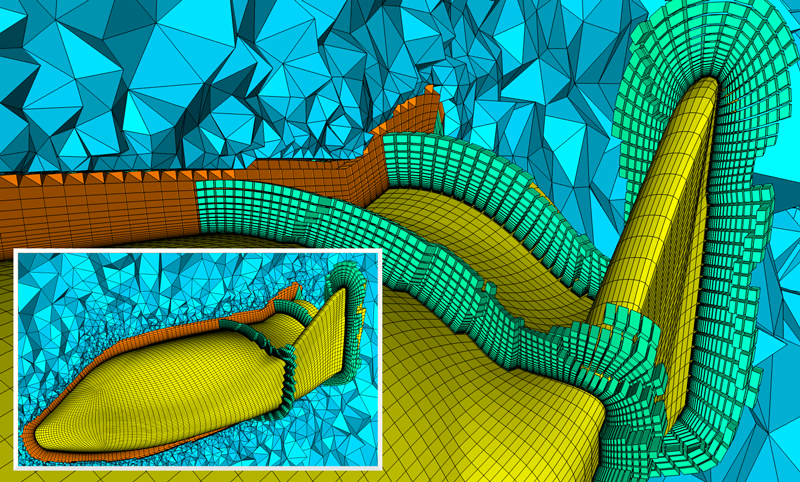 Pointwise is now compatible with Cradle's SC/Tetra v9+ flow solver. Pointwise Version 17.2 requires a new license file. You can get one using the standard procedure at www.pointwise.com/licenses.